Ladies and gentlemen, this is the sound of provoking the gods. Those above, and those down under. It’s beyond music, it’s more an experience. This band is extremely loud, harsh, bizar, bombastic, intimidating and even frightning. This band is Sword Heaven and they played at the OCCII Amsterdam (supporting act for Lightning Bolt). A while ago we interviewed Daniel of the UK band Father of Boon. We asked about the future of the band, and Daniel, the band’s guitarist replied: “We’ve been going for a long time now, so we’ll see… haha”.Â And we have seen,Â ’cause they broke up. But hey, we have the interview, we might as well post it. About the band, combining being in a touring band with a normal life, Fugazi, and much more.. Trying to catch up with recent releases, here’s another important one from 2008: If a band says they’re inspired by June of 44, Unwound, Rodan and Hoover, they’re automatically qualified for a review here. It’s not that I personally think they sound a lot like any of them, but there’s the noise-ridden, super-loud production that makes them sound 90s, and it’s so authentic that I have a hard time imagining it’s new. And we’ll value any effort in this regard. Gods & Queens do their own thing. Everything is Untitled with this band, and that kind of emphasizes how their songs are a little hazy and anonymous when played alongside each other. Normally music will make your feelings surface through dynamics – loud vs. quiet, fast vs. slow, noisy vs. clear etc. 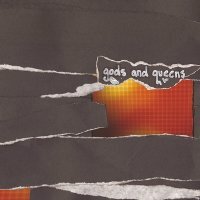 But Gods & Queens are a bit simpler, mainly just sticking to loud and noisy. What you’ll be looking for is the slow progressions and the melody changes buried deep within the noise. It might make the album hard to enjoy at first, but as you spin it further and get to know them, it gets easier to tell what they’re doing. This might sound like a failure, but make no mistake that this album couldn’t have been done much better with regards to shoegazed frustration and fear. Track 4 is probably the most accessible track due to its gentle beginning, building upon the same jam throughout its duration, but gradually increasing in loudness. The closing track of the album has the same formula as the other tracks, but extends to almost ten minutes, and this is in my opinion where they have the strongest impact, although it’s better to judge this album as a unity. Gods & Queens might be near your favorite venue in Europe in April, so be sure to catch them. As you might have heard, Ron Asheton, the guitarist of rock legend Iggy Pop and the Stooges and Destroy All Monsters has died. A few years ago at the lowlands festival me (Ralph), Falco and thousands of others had the privilege to see the stooges live. It still is the greatest show i’ve been too till this day. Incredible how a bunch of dudes in their 50’s and 60’s could rock all the younger bands into oblivion. The ‘now i wanna be your dog’ riff is still one of the best riffs the best, played on a guitar… ever! His guitar playing turned out to be very influential on almost every genre of guitar music. And it certainly has had it’s influence on me. Nantes label Kythibong has an interesting menu these days, judging from which there should be no hesitation acquiring what they put out. 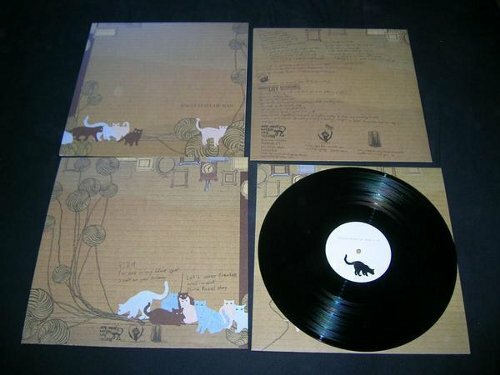 This one is a CD release of 250 copies all in cardboard and with an impressively clear silkscreen print featuring the 4th Baboon, a wise-looking elderly baboon with beautiful white hair made by label-mate The Healthy Boy. 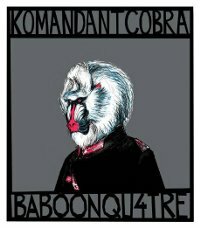 Komandant Cobra sounds a lot like 31 Knots, but they are far more a rock outfit, with a flair for moving from quiet guitar sessions to hard-pounced drums all nicely put into effect by a well-fitted production. The track Moi Le Rouquin begins with a pretty hefty guitar riff instantly being backed up with some of the most crispy drumming, I’ve heard for a long time, reminding me of how the new Papier Tigre and Shellac sounds, too. They keep playing like that for a few minutes until slowing down and adding lyrics. And this part might sound surprising at the first listen, because singer Emmanuel Ligner puts a lot more effort into beauty than aggression — done too by 31 Knots and Frank Shinobi, but K.C. dares to sound even sadder at times. In general it’s a really nice effort, and maybe they slow down a bit too often for my taste, but heck; Tracks like Fish, Moi Le Rouquin and We Get Astray reveal a strong outfit, and let’s hope to see them finding their way around Europe. This is beautiful! 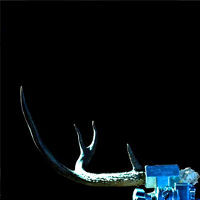 Single State of Man sounds a bit like Explosions in The Sky did in the beginning, using 4/4 drives with beautiful clear finger-strummings building up to noisier distorted sequences and then more quiet, more loud… but everything moving naturally and incorporating distant screams. They don’t generally sound like City of Caterpillars, but because of their touch of screamo I find that comparison reasonable, since CoC has a lot of post-rockish melody in their quiet moments, but still retaining some pace, that makes it less meditative than post-rock. It’s like CoC’s quiet moments are other band’s loudest moments, and what SSoM does is to play very dynamically so the monumental parts don’t arrive with long buildups, making it all less predictable, but at the same time nonetheless monumental. Currently they’re gearing up for a Europe tour with Men As Trees in August. So as somewhat opposed to drinking, smoking, snorting or injecting them: Eating them. Artists are getting pretty creative. Record and song title. I hope it’s on purpose. Sounds like a punk anthem to me, but of course they play the vulnerable indie card, too… they’re afraid of drugs. To start off with, and true to their old style is something up-tempo, the album is happy, instrumental and without lyrics.. carrying this prog-rock sound with added pace. Melting keyboards and fast guitars with interesting rhythmic signatures that’d make most people agree that they’re mathTM-inspired. But we’re being taken in very different directions, sometimes more electro and sometimes more punk. File under party-music, and then try to keep an open mind and remember that when you’re having a party, a compilation always works better than just playing the saaaaaaaame. This is a compilation made by 11 different bands with the same name and the same people. It makes for an interesting listen and a guarantee that you’ll find something in the mix that suits you. For me the highlight comes with the closing song, the 5:45 one, which is a bit more straightforward, but really shows a versatile band owning and sharing many properties, and mixing these in a way that finds them fit for entertaining any party.